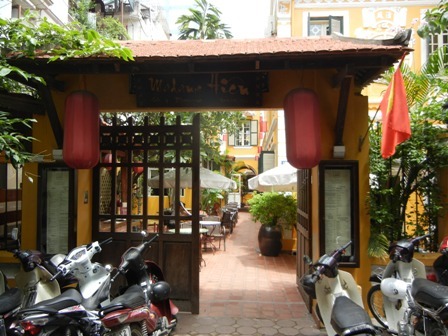 In a beautiful French colonial building you will find Madame Hien, a restaurant offering traditional Vietnamese food in Hanoi. We had a business lunch there (May 2011). 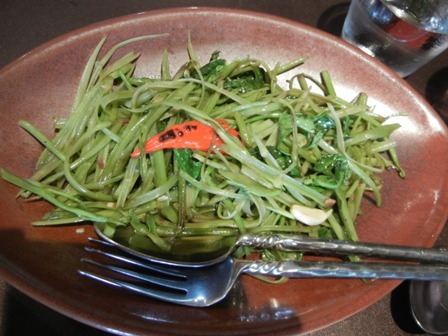 Therefore, I could not take many photos of the surroundings and the food. Please forgive me. I promised myself that I would come back to the place when I’m in Hanoi next time. 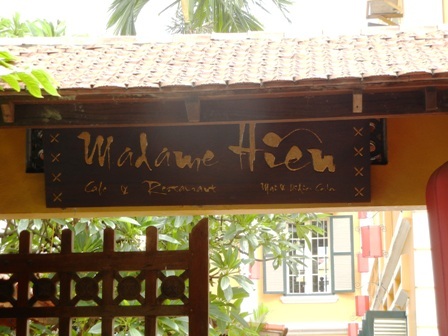 Madame Hien is owned by the celebrated French chef Didier Corlou. He comes from Brittany and owns another restaurant in Hanoi called La Verticale. 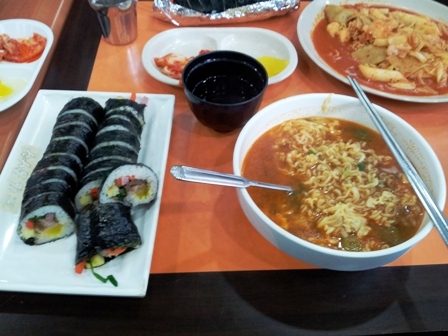 As you can see from the menu above, a three course meal costs about 200,000 Dong only. 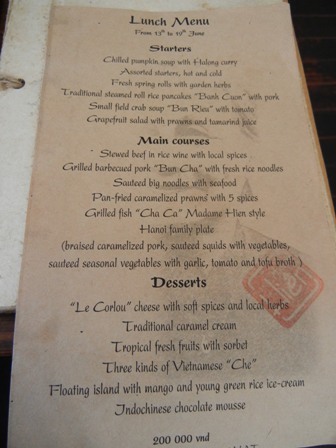 The dishes one can select offer a wide variety of Vietnamese delicacies. I took something light and enticing. 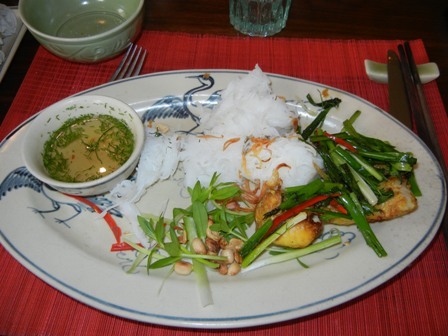 As starter I selected the grapefruit salad with prawns, followed by the grilled fish “Cha ca” Madame Hien style. 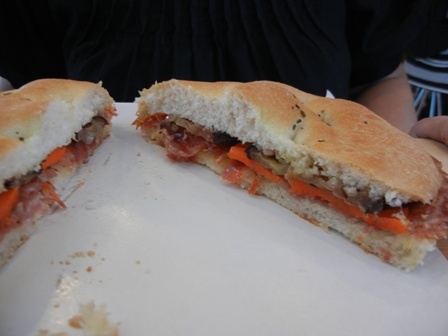 I finished with the cheese “Le Corlou” to honour the chef. 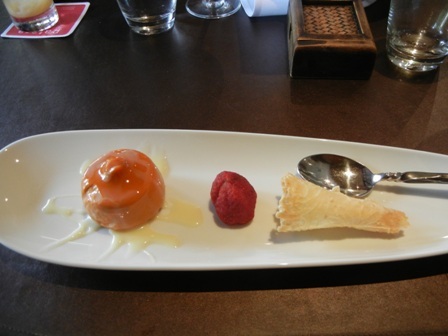 All of the dishes were delicious, excellent. Trip advisor gives 4 of 5 stars to the restaurant. 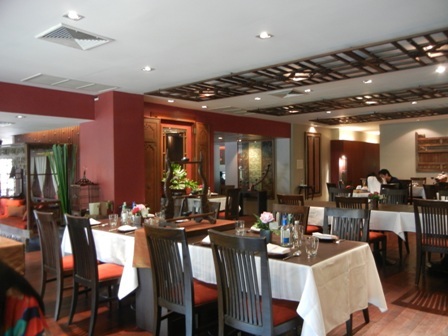 There you will find as of today 210 reviews, 90 of which rank the place as “excellent” and 72 as “very good”. 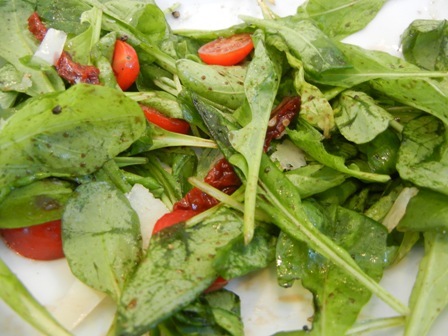 Unfortunately, the most recent reviewers seem not to have had a good time at the restaurant. No idea what happened. Sure is, that I will come back, next time with a bit more time on my hands, and so that I can have a glass of wine with the food. See you there, maybe. 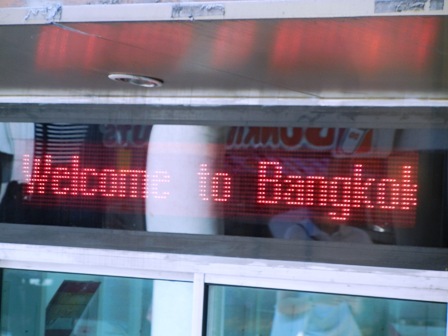 Bangkok is a fascinating Asian mega-city. Millions of people visit it every year. Bangkok is where different people from different cultures meet, relax, shop, trade, interact and enjoy each others diversity. 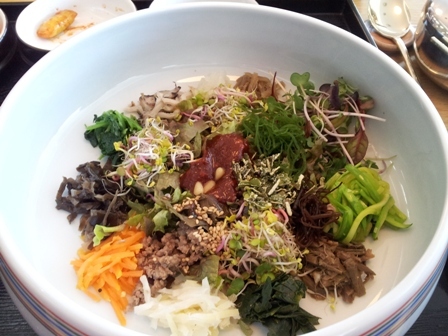 This is also reflected in the great variety of different eateries from East and West. None of the major world cuisines is not represented. 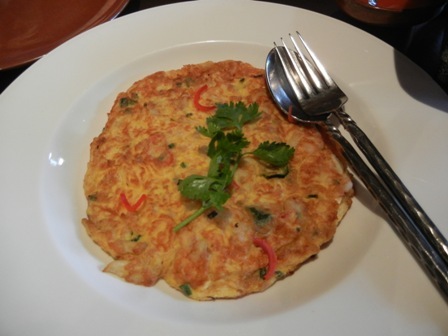 And Bangkokians love food, their own and foreign food. 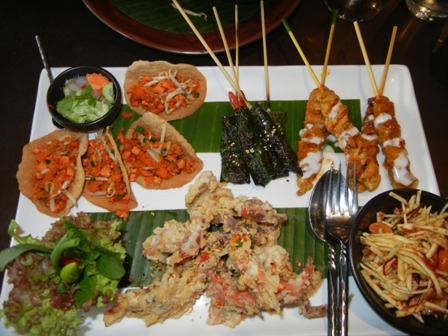 Therefore it is no surprise that Bangkok has a vibrant restaurant culture catering to the needs of the poor and the prosperous alike. 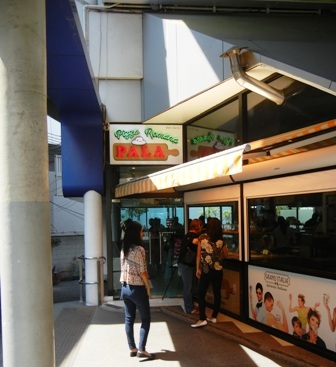 Recently, I discovered a new Italian eatery, La Pala, right below the Asoke BTS train station. 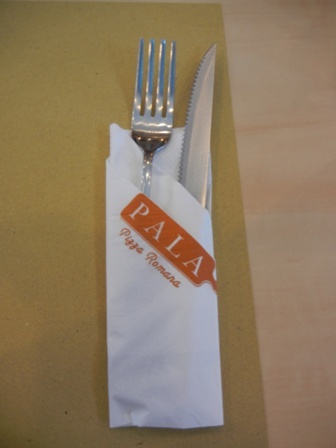 La Pala offers Pizza Romana style food. 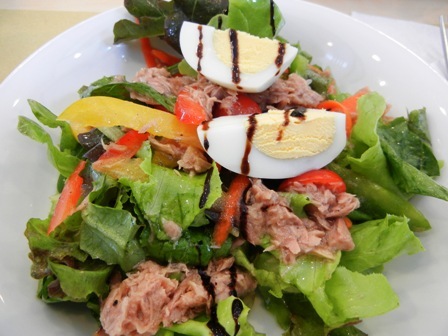 The quality of the food ingredients is the key, as are the service and the hospitality in general. La Pala is not a romantic place. The crossing with the BTS station, the underground, the overpass and the shopping malls around it, is one of the busiest corners in Bangkok, bustling with people and traffic. La Pala is “practical” without frills, it is down to earth and at the same time a place to escape from the hustle and bustle of Bangkok. 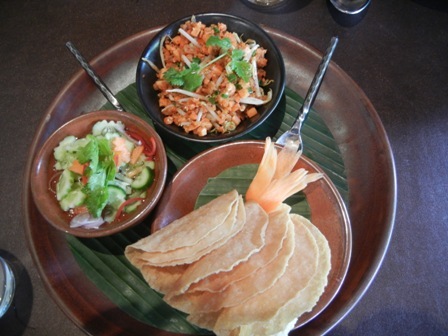 The food is simple but delicious as you can see from the three pictures below. 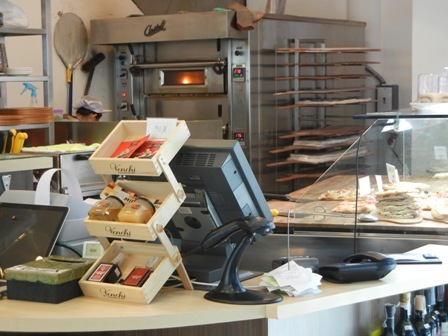 Of course there is also pizza by the half-meter and the meter, or in small pieces. But you can also order a pasta or a risotto. Italian food would not be complete without wine. This is one feature I like best in La Pala. 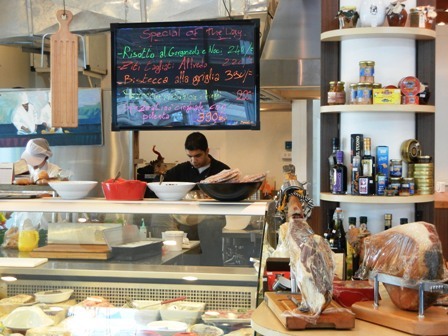 You just order by the glass or a bottle, and there is some good choice of delicious Italian wines. 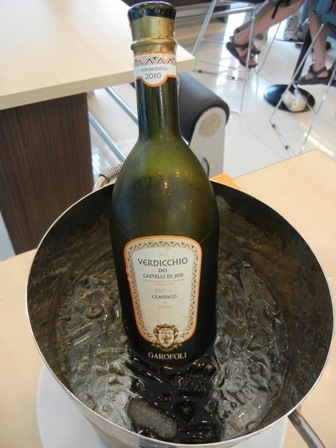 We sampled a bottle of Verdicchio dei Castelli di Jesi, a region West of Ancona in Le Marche. It was immediately put into a bucket with ice to keep it cool. Claudio Volpetti, the owner, is from Rome. 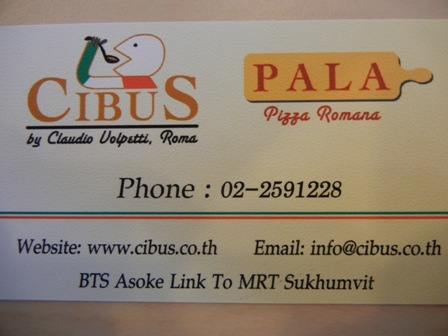 He imports high quality Italian food items for five star hotels in Thailand. He has also a small selection of wines you can order with a order form called Wine “Meranda”. On this list you can find an Amarone delle Valpolicella by Villa Girardi, a Moscato d’Asti Nivole by Michele Chiarlo, Crede Prosecco Brut by Bisol, a Verdicchio dei Castelli di Jesi by Garofoli and Liano, a Sangiovese Cabernet Sauvignon blend by Umberto Cesari. 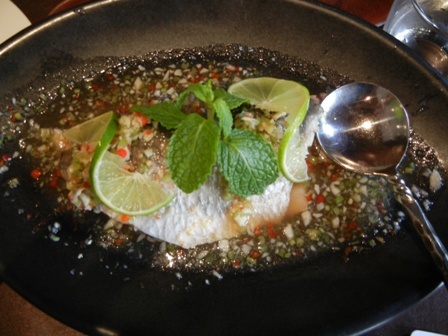 So if you find yourself hungry and stressed out from over-shopping in Bangkok, go to Asoke BTS station and find refuge in La Pala, enjoy the warm hospitality, the excellent food and fine wines. Needless to say you will bump into many Italians there, clear evidence for the outstanding quality. Check it out. Enjoy a bit of home far away from home. 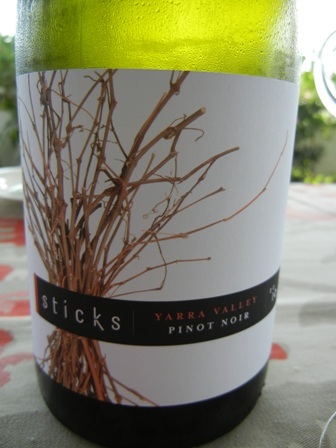 The last thing I did at Melbourne Airport when we left for Thailand in early January this year, was to buy a bottle of ‘2010 Pinot Noir’ by Sticks Winery. I knew the bottle would not last long. On a Saturday when we felt like rural folks, we had it with a hearty meal of cowboy food. Sticks Winery and its vineyards are located just opposite the old homestead of the Sadlier family at the foot of the hill South-west of Yarra Glen, called Christmas Hill. My friend Steve Sadlier had set up most of the vineyards many years ago when the place was still known as Yarra Ridge Winery. If I remember correctly, my first ever wine tasting in Australia was in the tasting room of this winery. The wines were presented by Meagan, who became Steve’s wife a couple of years later. Sticks was the first vineyard I walked through in Australia. Goodness me that’s now so many years ago, maybe 1991 or 1992. I was not sure if the wine would go that well with rural tucker. 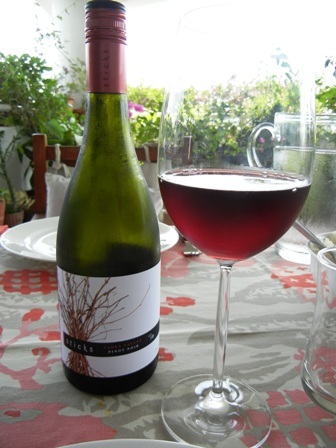 After all Pinot Noir makes a delicate and refined wine, something subtle and gently textured. And Sticks Pinot Noir is exactly that with delicious fruit aromas from wild cherry with a bit of spice, long on the palate with a suppleness hard to imagine. Maybe ill suited to the food we were going to have, I thought. 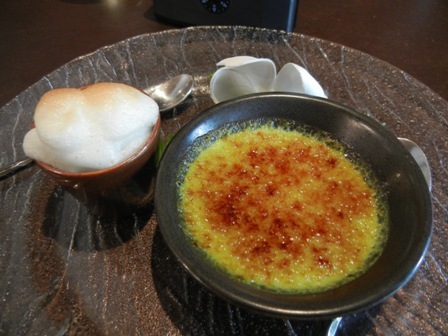 However that may be, we were in for a dish by Jamie Oliver, one of my favourite chefs of modern cuisine. 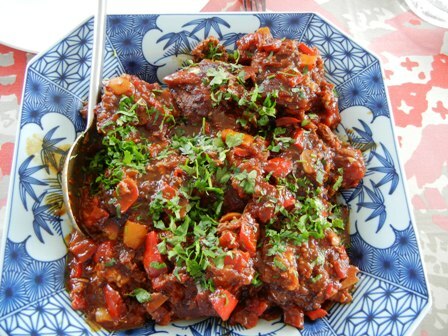 From his “America” book, we cooked the Mountain Meatballs (page 308). These meatballs are spicy. Jamie Oliver made up the recipe, he says in the book. The true Rocky Mountain dish is made of “prairie oysters”, sheep or cattle balls. We followed Jamie more than the wild West tradition. The melted cheese in the meatball is just wonderful creamy. I also love the slight coffee aromas. 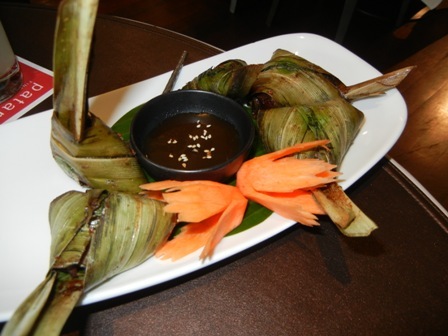 This dish is a ripper of bush tucker, as we would call it in Australia. 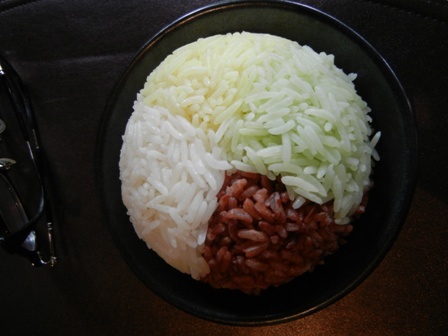 We served it with rice. I could eat it for breakfast, I must say, with bread or potatoes. Jamie suggests a wine from the Côtes du Rhône, most likely a Grenache, a Shiraz and/or a Mourvèdre. Next time we’ll have these meatballs, I will try that. Human memory is anything but perfect. In fact it is one of the most fallible of human organs there is. In hindsight we clear out memories we do not like any more. We add and subtract from it, we construct stories which never happened in the first place; we make sense where there was none before. Our memory seems to possess an independent creativity that bears only a passing resemblance to actual events. That’s why wine geeks keep tasting notes, isn’t it? But even if we do, aren’t we deceiving ourselves, mixing up things, are influenced by the circumstances, the sympathy we have for the people we tasted the wine with, the location and the situation when we finally write it down as in a blog entry? We humans like a narrative. We love to connect the dots even if there is little connectivity, no correlation not to speak of causation in the first place. Please join me while reminiscing about the past year. What was the best Syrah I drank in 2011? Please allow me to take you to my “winner”. It’s a wine by Thierry Allemand from Cornas village, a small wine region in the Northern Rhone, northwest of Valence, the charming small French town at the Rhone river. I guess you have heard about the vintener and wine-maker Thierry Allemand. The best piece on the internet about Thierry Allemand, I found on http://www.wineterroir.com. Thierry Allemand is one of my favourite French wine-makers. Here you can indulge yourself, see the man, learn about his vision, his vineyards and his wines. 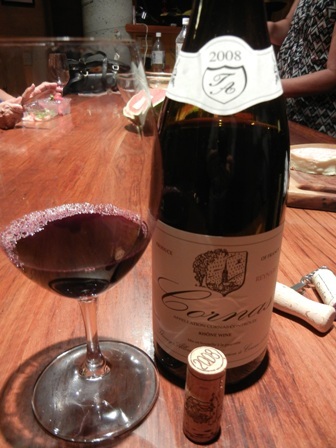 The first Cornas by Thierry Allemand which was served to me was by my good friend Timo Mayer at his home in the Yarra Valley. 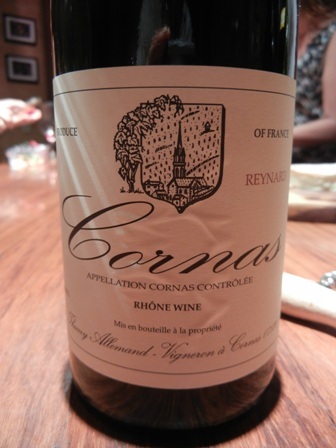 It was the 1996 Syrah Reynard cuvee from Cornas. The wine tasted like burned rubber which is sometimes labelled as a fault. But I liked this funky wine. 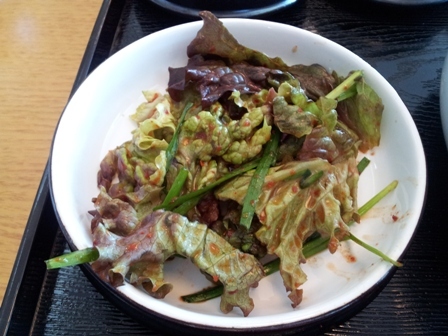 It was wonderful complex and full in the mouth, with thr right spicyness. One feels like in paradise while the wine slowly winds it way down the throat. Timo Mayer presented me with the 2008 vintage of this wine (last Christmas while at his house). It is difficult to describe this awasome drop. In comparison with the 1996 vintage, I would call this wine “domesticated”. It is not wild as the 1996 vintage. It caters to the more mainstream taste, of what Syrah should taste like. I was not disappointed, not at all. However, I prefer the funkyness of the older vintage. 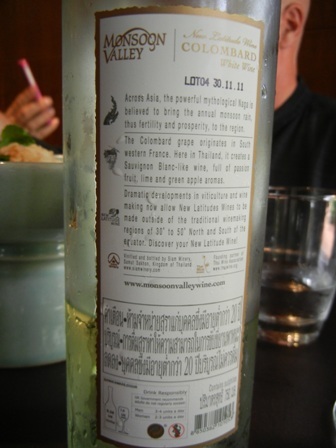 How can I get access to this wine in Bangkok? Does anybody have an idea? 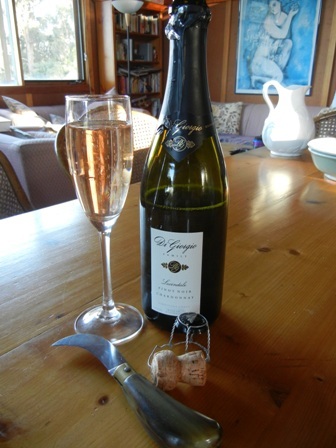 One of the many refreshing bubblies we tasted during our Christmas holidays in Glenburn, was this bottle of Di Giorgio sparkling, a blend of Pinot Noir and Chardonnay wines. I had bought it in our local supermarket in Yea. 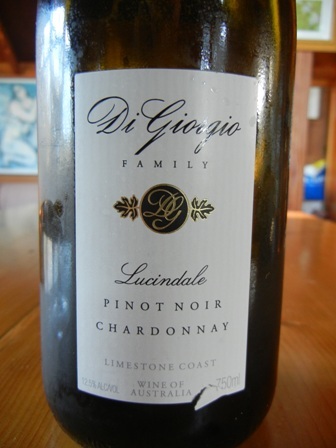 Di Giorgio Family Wines is a family business celebrating in March its 10 anniversary. Some of the vineyards are located in Lucindale district of the limestone coast near Coonawarra, South Australia. Stefano Di Giorgio migrated from Italy to Australia in 1952; with his wife Rita, he has four children. Apart from viticulture, the family holds interest in cattle, sheep, wool production and horticulture. In 1989 the first vineyards were planted in Lucindale. Today, about 126 ha are under vines, and Cabernet Sauvignon, Merlot, Shirz, Pinot Noir and Chardonnay grapes are produced. The holdings in Coonawarra covers almost 228 ha under vines. Apart from the varieties above, they also include some Cabernet Franc and Tempranillo. From 1998 onwards the Di Giorgio’s decided to move from fruit growing to wine-making, and in 2002 they established their own winery. The enterprise is not small. I wish to congratulate them to their anniversary and wish them well for the future. The sparkling Pinot Noir (85%) Chardonnay (15%) is a very fresh and refreshing wine. 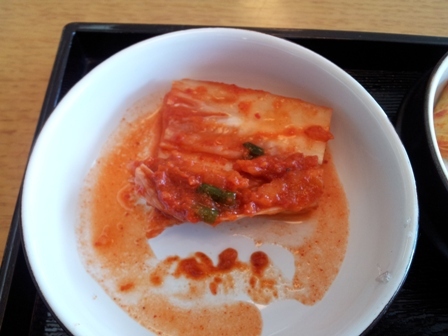 I loved the strawberry aromas and the spicyness. 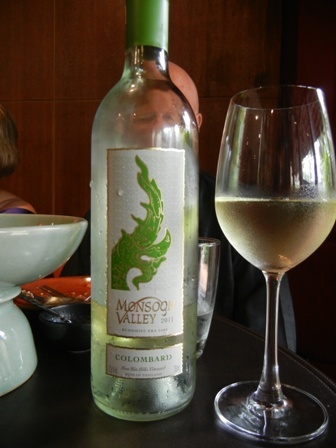 It is not completely dry but carries some hints of sweetness. The soft creaminess is lovely and gives it a very “homely” character. You are currently browsing the The Man from Mosel River blog archives for March, 2012.